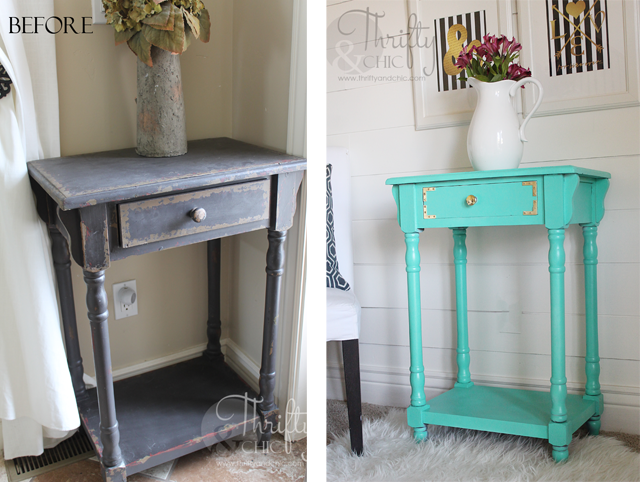 It's been forever since I have painted a piece of furniture without repurposing it too. It was kind of fun...and easy :) I should probably start doing it more often, but then again, I'm also running out of places to put things in my house lol. I was planning on going to the thrift store by our house to pick up some cute side tables for a room I was redoing, but decided to bag it since I knew the prices I would find. They seriously think they are the Ashley Furniture clearance area. I kid you not. The turnaround there is pretty slow because of it too. So, I decided to nix it and get some fabric at Hobby Lobby instead. Then of course, I saw Hobby Lobby's sale. And...yeah, ended up coming home with 5 tables, and 1 yard of fabric :) I picked up this table for just a little bit more than what I would have gotten it at the thrift store. I kept telling myself "I'm not going to paint this white. I'm not going to paint this white." Even though every ounce of my being was wanting me to do so. I even bought some white spray paint 'just in case' lol. I was talking to the hubs telling him that I'm thinking I just might end up painting it white and he then told me to just get a white paint bomb and explode it in our house to save time :) Luckily I've been on somewhat of a color kick lately cuz that would have been messy. 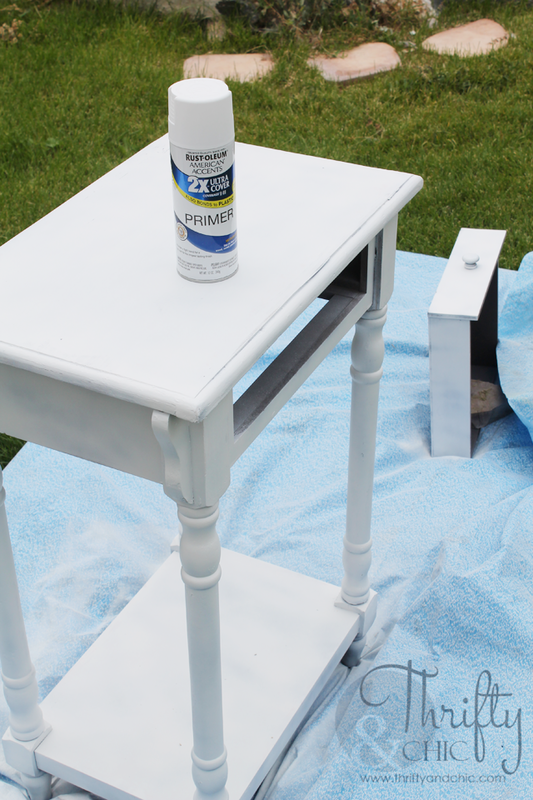 This table was just cheap mdf and horribly finished (in my opinion), so I decided to sand the heck out of it and give it a good dose of primer. I then went out of my comfort zone and changed the beautiful white primer into Krylons "Sea Glass". A little bolder than I anticipated :) I've been wanting to do some brass/gold details on some pieces of furniture for awhile now, and I figured this would be the perfect piece since just painting it would be so boring. So, I grabbed some corner brackets and a brass knob and added them on. And since it was already pretty gawdy, why not go all out? 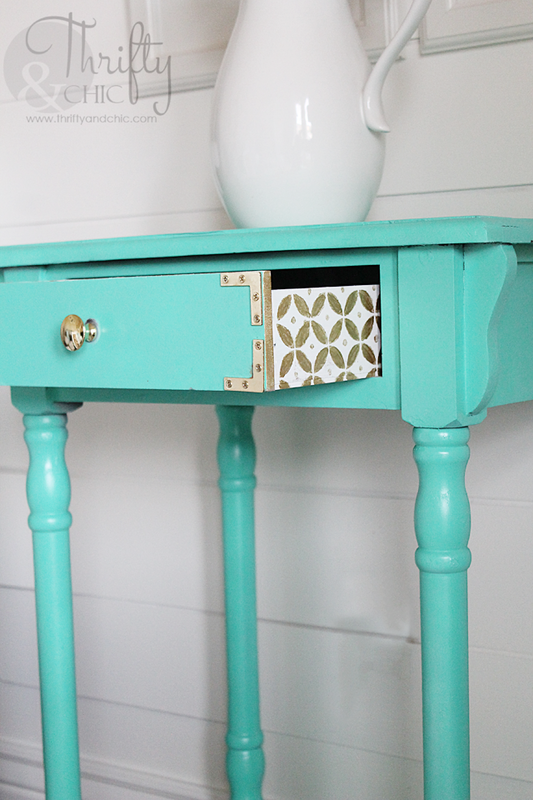 I stenciled a cute design on the drawer with some gold and white paint. I love how this looks, opened and closed. I'm loving this piece, but it only looks good on my white wall, not my beige walls. So, now I have to go and paint another wall white lol ;) Or I may just end up using it in the bedroom I just redid at my mom's house. 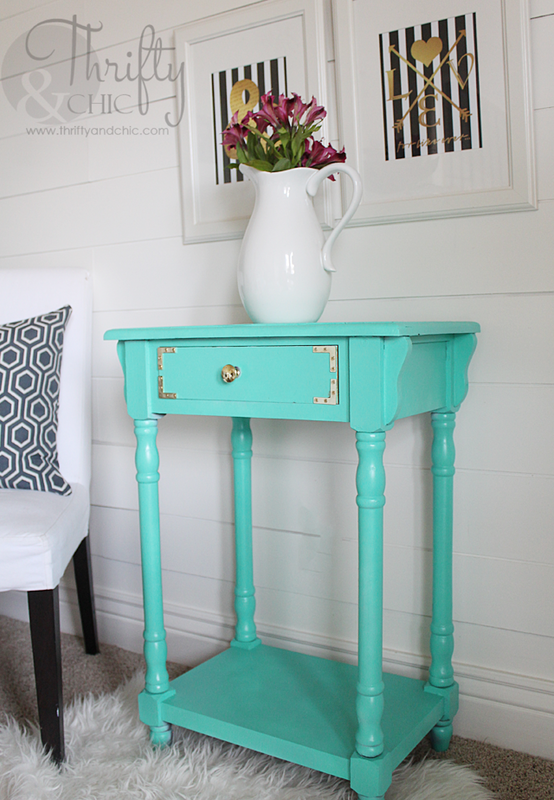 What do you think?...or maybe I will end up painting it white again so it fits back in my house lol. 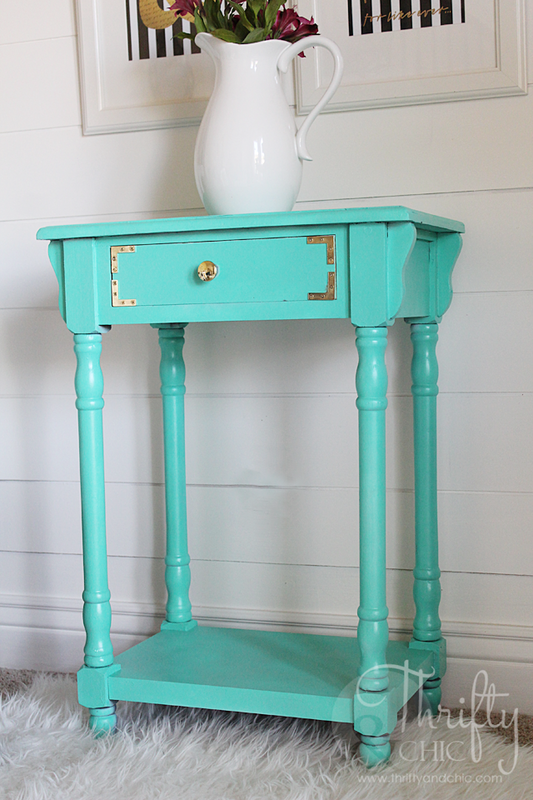 Cute table, I love the gold details and white or black would be smashing with the gold. So adorable! I love the brass detail and gold paint. Where did you get the brass hardware and what gold paint did you use? 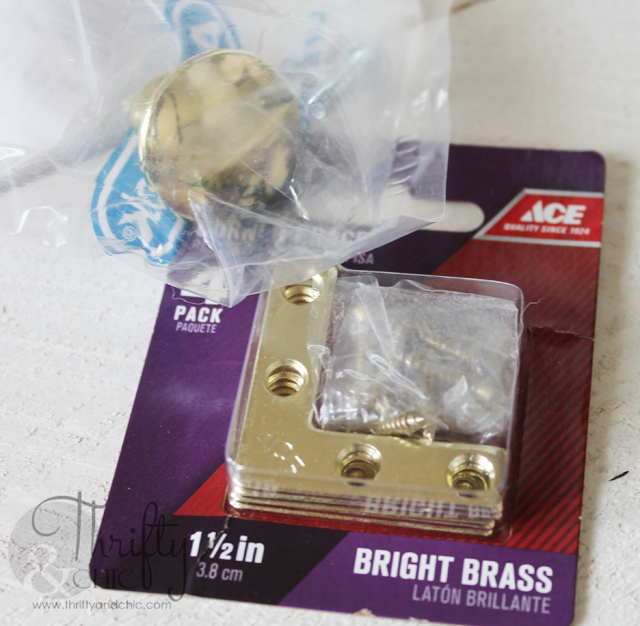 got the hardware from Ace and the gold paint is just an acrylic metallic paint from FolkArt I believe. wow this turned out so great! 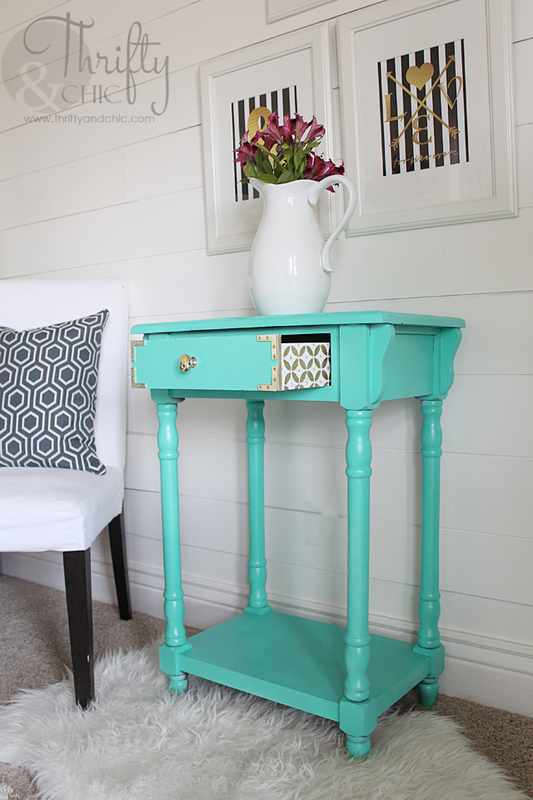 I love all of the gold accents especially the stencil on the side of the drawer. Also wanted to let you know that I will be featuring this at my Favorite things friday! What a great find! 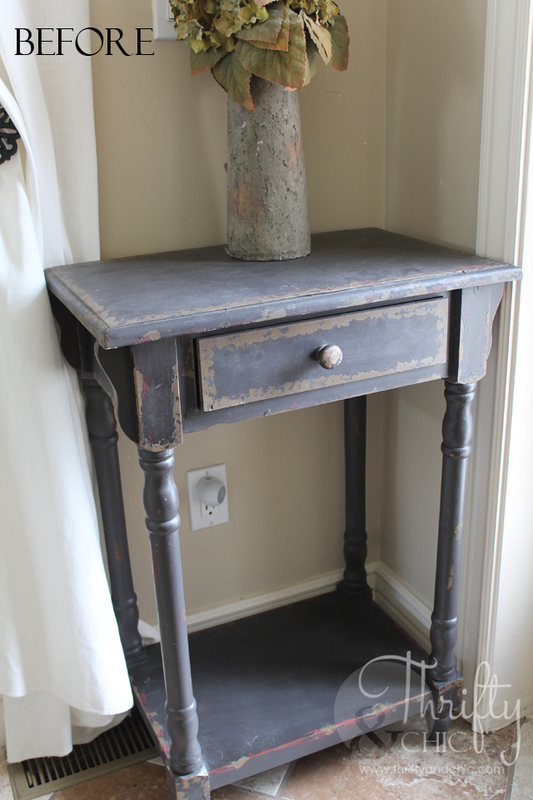 That's a really nice side table, and looks like the perfect piece for your room. I am sorry, but I liked it so much better before. I actually came to the site thinking that it was a tutorial on how to make it look like the before photo. It is very shabby chic. To me the second one looks all shiny, plasticy, garish. I love the color you chose!